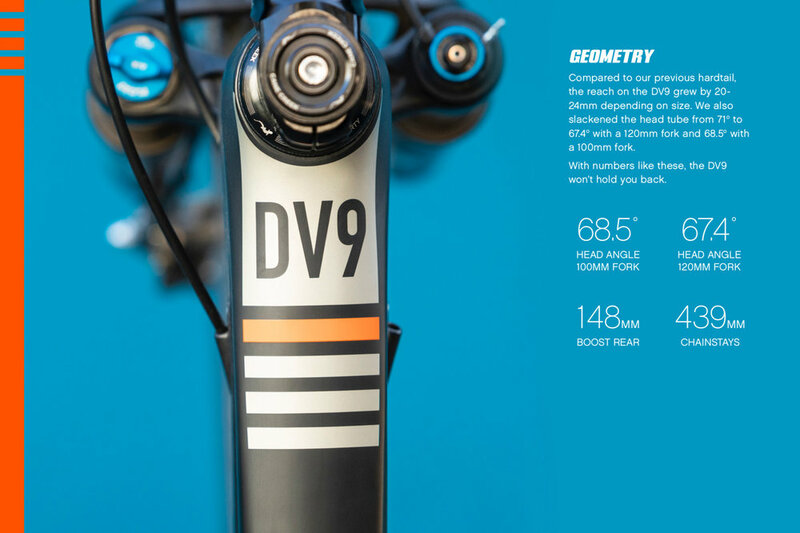 With a slacker-than-XC (aka down- country) geometry and massive tire clearance, you can take the DV9 on a training ride Friday, race Saturday, and roost Sunday. And the best part? The 1,204 gram full-carbon frame goes for $999. That’s roughly $250 more than a comparable aluminum frame. The DV in the name stands for development because this is a bike you can grow with. Lili Heim proved that in spectacular fashion, by taking three varsity race wins, five varsity XC podiums, and first place overall in the 2018 Northern California NICA* league on a prototype frame. Race tape, root fest, or both. Your choice. You can line up for race day in confidence with a 100mm Fox Step- Cast fork with remote lockout and 2.25” fast guy tires. Or, shralp past your buddies on their full suspension rigs with a 120mm Fox Rhythm 34 and physics-defying 2.6” tyres.